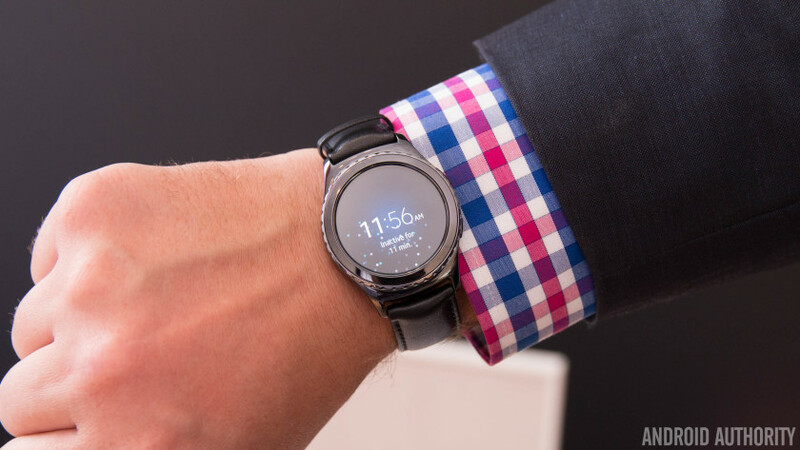 Samsung's first round face smartwatch ticks a lot of boxes and despite a lack of third-party apps, the Korean OEM has delivered what I believe to be one of the best smartwatches ever. Smartwatches aren’t a new concept but, similar to tablets, they experienced a period of growth before the market stalled as other technology endeavours – Virtual Reality and Drones come to mind – came to the forefront. For wearable OEMs, building an Android-compatible smartwatch that is capable of achieving the same level of success as the Apple Watch has proved to be somewhat of a challenge. Thankfully, Samsung may have finally stumbled upon a recipe for success. 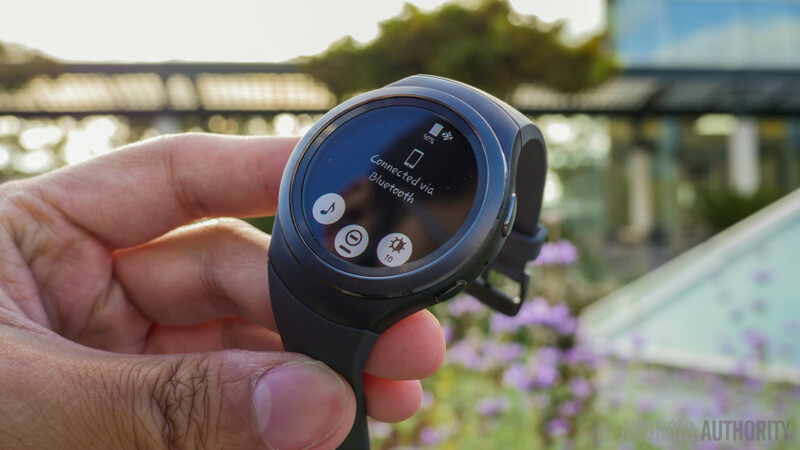 The company’s first Gear smartwatch ran on a customised version of the full Android OS, but since then, we’ve seen the Korean OEM take a different approach to wearables through its own Tizen OS. Built from the remains of Nokia and Intel’s failed MeeGo OS, Tizen is made by Samsung and Intel and over the past few generations of the Gear smartwatch range, we’ve seen the platform evolve considerably. 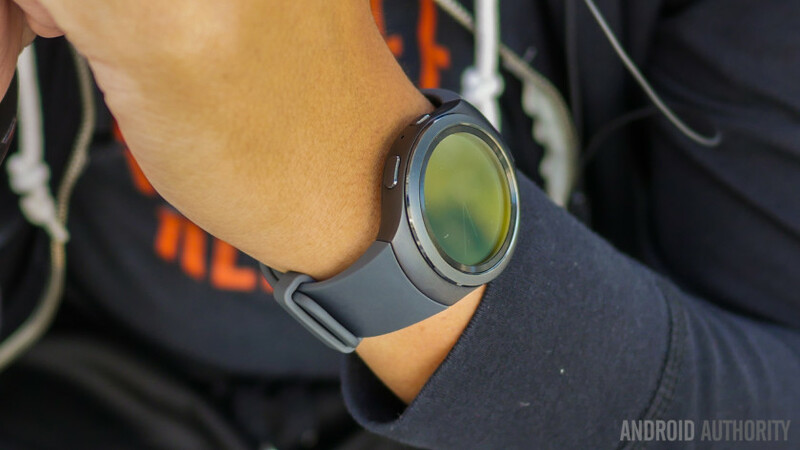 Now, in the Samsung Gear S2, we have a flagship wearable that showcases just why Samsung opted to use Tizen instead of Google’s Android Wear OS. After holding off on my purchase since it launched last October, I finally succumbed and replaced my Moto 360 2nd Gen with the Gear S2 at CES earlier this month. Below you’ll find my follow up review to Josh’s initial review of the Gear S2, which you can read and watch here. When designing wearables, companies seem to take one of two approaches: aim for the sporty look that is unmistakably a smartwatch or aim to blend in with the luxury watch segment. Some aim to straddle both approaches and with the Gear S2, Samsung has done just this; for those wanting all the rugged features without trying to blend in, the Gear S2 is exactly this, complete with its silicon band. For those who want a luxury smartwatch, the Gear S2 Classic has a leather strap for a traditional quartz look with the addition of some very smart features. The original version is the model I’ve been using and although the Gear S2 Classic was my original choice, the sportier look of this version actually appeals more. One of the biggest benefits of the silicon band is that it barely shows any use with age, whereas leather has a habit of looking worn with minimal usage. The leather straps on both my Moto 360 and my Huawei Watch showed wear after a little passing of time, with the Moto 360 being the worst offender. It’s nice not to have to worry about this. The silicon bands use a proprietary connector to connect to the stainless steel body and this means you can’t really change the design of the watch. The lack of traditional connectors means Samsung has been able to remove the lugs that are present in a more conventional design, which some people like but I find disconcerting. The main body of the Gear S2 is made from stainless steel with a Home and Back button on the side, which let you interact with the OS in many different ways and a heart-rate sensor on the back. The key feature that sets the Gear S2 above many competitors is the unique rotating bezel around the display, which rotates with a reassuring click and is used to interact and navigate throughout the smartwatch. The Gear S2 sports a 1.2-inch Super AMOLED display with 360×360 resolution that offers 302 pixels per inch density. It’s an excellent display, is vibrant and easy to read and even in direct sunlight, it still remains usable. A particularly nice feature is that while the display doesn’t support auto-brightness, you have the option to set a minimum brightness level and the display brightness will automatically increase to a higher level depending on the amount of ambient light. Overall, the Gear S2 certainly isn’t perfect – there are plenty of people that will find the inability to connect to traditional watch straps quite frustrating – and the buttons do take a little getting used to, but the rotating bezel is a fantastic idea and truly sets the Gear S2 apart from other smartwatches. The smartwatch feels pretty nice on the wrist, has a noticeable, but manageable, amount of weight and fits in with almost everything you’re wearing. It manages to be unassuming yet functional and compared to some very odd choices on previous Gear smartwatches, the latest from Samsung finally gets it right. A question many people have asked me is whether the Gear S2 has a GPS antenna and the answer is somewhat complicated, as it depends on which version of the smartwatch you have. The Gear S2 is available in Wi-Fi and 3G variants and if you opt for the latter, it’ll come with an e-SIM and speaker, GPS and a larger battery (300 mAh vs 250 mAh). The lack of GPS may be considered a downside by fitness fanatics, but the Gear S2 somewhat makes up for it as you’re able to add songs to the 4GB internal storage and play them directly to your Bluetooth headset. 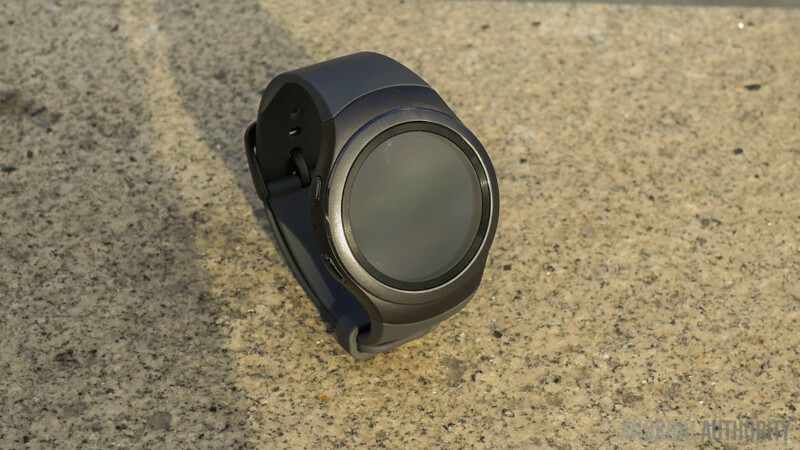 This allows you to leave the tethered phone at home (unless you need GPS-mapping) and Wi-Fi support means you can continue to use the Gear S2 as a standalone device. 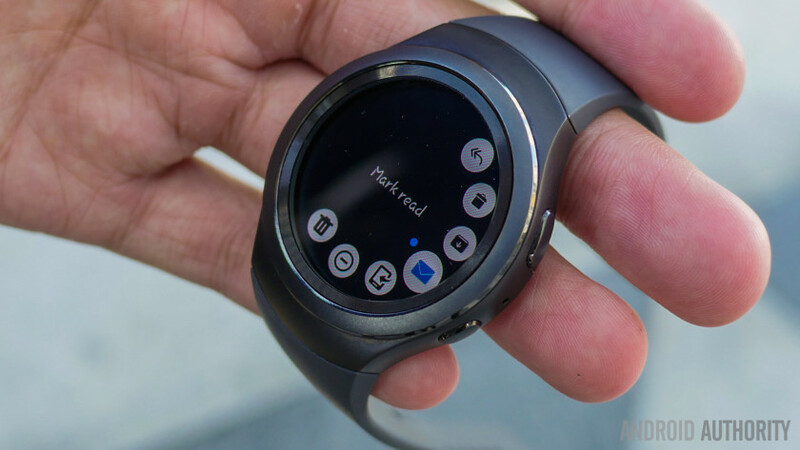 One of the biggest improvements with the Gear S2 over past Samsung smartwatches is that it is now compatible with any Android smartphone running Android 4.4 or later, and will soon be able to connect to the iPhone as well. When used with non-Samsung devices, you are required to install a number of Samsung specific applications to get everything to work but the experience is almost identical to when paired with a Galaxy smartphone. Like other wearables, the Gear S2 does have a fitness-focus of sorts, with S-Health proving quite the capable fitness coach. This begins from the home screen where a widget tells you different metrics (example, how much water or caffeine you’ve consumed) and your activity levels. When you’re working out, S-Health is able to record your heart rate and display it in a rather cool graph and of course, all the data is synchronised right back to your smartphone as well. The Gear S2 smartly measures your activity levels and gives you helpful prompts to get moving when you’ve been idle too long; as someone who often spends long periods at a computer, the prompts to move – which are usually around an hour after you’ve been idle – act as a rather useful reminder to take a break. Under the hood, the Gear S2 is powered by a 1GHz dual-core processor (of unspecified variety) and 512MB of RAM. Those specs may look somewhat perplexing on paper but are in line with the current generation of wearables, and it’s more than enough to keep the experience running along nice and smoothly. Previous Samsung Gear smartwatches have displayed a certain degree of lag with use, but despite adding music to the storage, apps to the smartwatch and having lots of unread notifications, the Gear S2 is seemingly infallible. The ability to marry the hardware and the software means Samsung has been able to deliver a smooth, carefully thought-out user experience that doesn’t require the latest hardware. As a result, Samsung achieved a level of optimisation – akin to Apple – that other Android Wear OEMs can only hope for. Powering the entire Gear S2 experience is the Tizen OS and while it does have some negatives, I personally believe it’s definitely a good thing, for the simple reason that it provides a welcome difference in an otherwise somewhat-stale market. While Samsung is seemingly committed to Android on its smartphones, its televisions and even its fridges, the company seems to be keeping a cautious distance to Android Wear. A particular reason is that while its been able to customise Android on all of the above, the Android Wear guidelines result in a mostly homogenous experience across all devices. In comparison, Tizen provides Samsung the flexibility and control that is sorely missing from Android Wear and the Gear S2 is justification for Samsung’s decision to use Tizen. There’s a lot to like about this experience (and some less than pleasing elements) but Tizen has allowed Samsung to deliver a unique smartwatch experience and in turn, Samsung has shown that having control over both the hardware and the software can yield great benefits. The rotating bezel forms a fundamental part of the experience and allows you to navigate through the various menus and screens. The software feels a lot more intuitive and easy-to-use than other options and the back and home buttons feel like natural elements once you get used to them. While Android Wear solely relies on voice input, Tizen adds a T9 keyboard for the times when voice dictation isn’t the most ideal option. Typing on a small screen is certainly not comfortable, but having the ability to choose the most appropriate input for your circumstances is a welcome choice to have. The bezel allows you to swipe between screens and options but you’ll still swipe up to dismiss notifications and tap the screen to select particular options. Then there’s the back and home buttons that allow you to return to the previous screen, go the home screen or open the apps drawer and finally you can also swipe down to access a quick settings menu. Despite all the various inputs, Samsung has somehow managed to make them all work together to provide a unique user experience that feels completely natural. One of my favourite parts of the Gear S2 is how it handles notifications; when you’re on the home screen, rotating to the left brings up all your unread notifications with each on its own screen. Tapping into it, you can scroll through the entire notification using the bezel and the circular display makes for easy viewing. I’ve read a relatively long email on the Gear S2 with no problems and then even sent a short reply – which is hidden behind the menu on the right – using the T9 keyboard. Granted, it was a 5-word reply! It’s not all positive however but the negatives are very much determined by what parts of the smartwatch experience are most important to you. For instance, the Gear S2 comes with support from barely any third-party applications; if you’re a fitness fanatic, apps like RunKeeper aren’t supported. There’s no Google Maps support either and although Samsung has made its own Maps for Gear app, navigation on the Gear S2 is still a moot point. If you rely on Google for reminders and contextual notifications, you won’t get them on the Gear S2 and apps with a large userbase like Evernote and RunKeeper are also completely missing. Widgets are also pretty limited with most displaying information from Samsung’s own apps and the lack of third party applications isn’t likely to change anytime soon. After all, developers can choose to develop for Android Wear or Tizen, and they’ll obviously pick the former, thanks to a larger number of devices and potential customers. The apps that are present on the Gear S2, like Yelp and Uber, show just how clever the rotating bezel can be, but for me personally, I use my smartwatch for notifications, fitness tracking and as a watch. I don’t need a ton of third-party apps and widgets, which will eventually and inevitably lead to performance lag and poor battery life. Instead, the battery life alone is one reason I’m more than happy to accept the limited Tizen experience. The Gear S2 is powered by a 250 mAh battery (or 300mAh if you buy the 3G variant) which may not seem particularly large but is more than enough to deliver excellent battery life. There’s no doubt that battery life is every wearable’s kryptonite, but the Gear S2 breaks the mould of current generation wearables. Most OEMs quote the maximum battery life a smartwatch can attain and most fail to deliver on their remarks but the Gear S2 is a complete surprise in this department. The Apple Watch is quoted as all-day battery life but is actually only capable of 18 hours so you have to charge it every night. Similarly, most Android Wear watches can last into a second day with minimal usage but will run empty in the middle of the day so you’ll have to charge it every night. Samsung’s past Gear smartwatches have also needed a charge most nights but the Gear S2 doesn’t. In fact, it’s the first fully-functional smartwatch I’ve used that can easily last several days; to provide some context, this excludes fitness-dedicated trackers and refers solely to full smartwatches. I will say that I’ve not spent extensive time with the Pebble range – including the Pebble Time Round which Josh highly recommends – and it’s worth keeping this in mind as they are quoted as offering excellent battery life. During my time with the Gear S2, I’ve found that if you keep Wi-Fi switched off when it’s not being used, reduce screen brightness to between 2 and 4 and use the Gear S2 solely for fitness tracking and notifications, the battery can easily last 2 full days and, depending on usage, even last a full third. The longest I’ve gone without charging it is 3 days, 4 hours and 41 minutes. When the Gear S2 does run low on battery, the included magnetic charging dock lets you charge it to full in one hour and if you need a quick top up, it can add around 15% in about 10 minutes. While you may wish to charge the Gear S2 every night, especially if you’re using it quite heavily, you can get along pretty comfortably if you do forget to charge it. The Gear S2 costs $299 for the original version we’re using here, with another $50-60 for the cellular version, or $349 for the Gear S2 Classic. At this price, it’s equal to the current crop of Android Wear smartwatches and definitely offers a rival experience. Like smartphones, certain features on a smartwatch will appeal to particular people and for me, the battery life on the Gear S2 alone makes it worth its price tag. Yes, the limitations are quite high, but I’m more than happy to take the rotating bezel and excellent battery life, instead of third party apps and a stale experience. Over the past two years, I’ve been able to experience almost all the smartwatches that have been offered to the market and the Gear S2 is the first that I’ve actually found useful. For me personally, the homogenisation of Android Wear worked initially but now there’s very little to separate the Huawei Watch from the Moto 360 2nd Gen and the Asus Zenwatch 2 apart from the hardware. No matter which one you choose however, you can expect to charge it pretty much every day. Let’s hope that Google loosens the reigns of Android Wear just enough to allow other OEMs to deliver truly unique experiences like the Gear S2.